Worked novaculite outcrops and quarry debris. Novaculite in a variety of colors may occur at a single quarry. Trench feature left from ancient mining at 3MN328. Battering novaculite at this outcrop left an “undercut” feature. Indians brought sandstone cobbles to quarries to use as hammers. 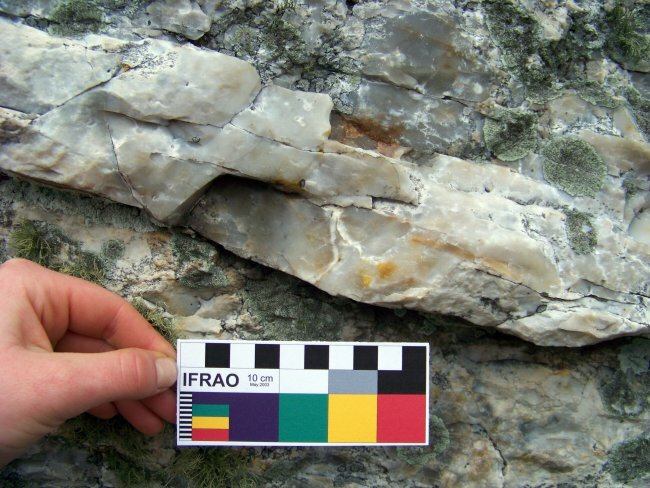 Hammerstone fragment and novaculite flakes are evidence of ancient quarrying. Archeologist Mary Beth Trubitt documents a trench at quarry 3MN327 in Montgomery County. Over 45 novaculite quarries have been recorded as archeological sites in Montgomery County. Many are on lands managed by the U.S.D.A. Forest Service. 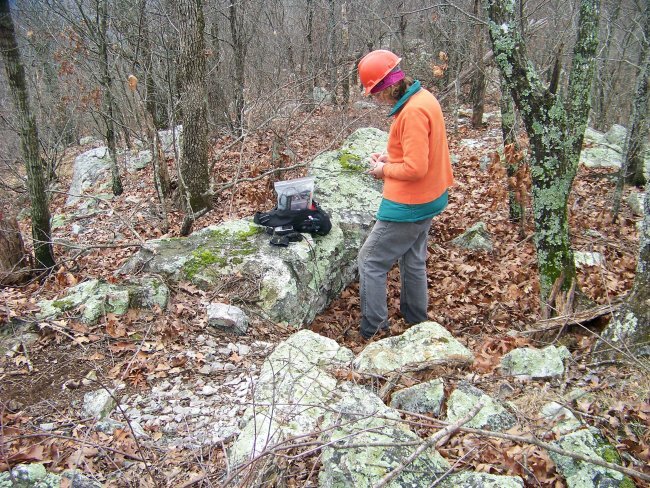 Indians looking for suitable toolstone in the Ouachita Mountains would find novaculite bedrock outcrops on ridges in the Benton-Broken Bow Uplift. They also dug pits and trenches to reach fresh rock that was suitable for chipping into tools. A small novaculite quarry pit is outlined with flags for photography at quarry 3MN328. 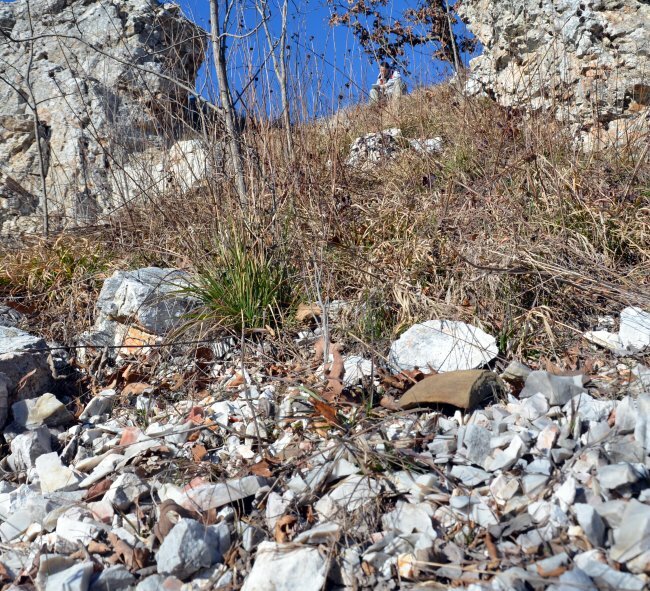 Ouachita National Forest archeologist Meeks Etchieson has identified several types of characteristic features at novaculite quarries in the Ouachita Mountains. Circular or oval pits were dug into bedrock novaculite or into accumulated quarry waste. Trenches result from mining high-quality seams or strata of novaculite. Battered boulders, vertical bedrock outcrops, or undercuts, shelters, and caves were left after the desired stone was dug and broken out. 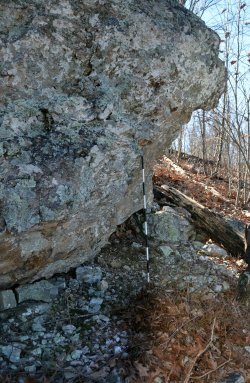 Battered novaculite boulder at a Montgomery County quarry site. Miners stripped surfaces to expose novaculite bedrock. Piles or debris fields of novaculite quarry waste, sometimes with hammers and other mining tools, mark these locations. 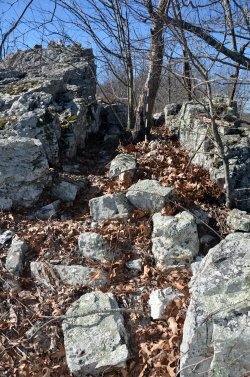 Several different kinds of quarry features may remain on a single mountain ridge. 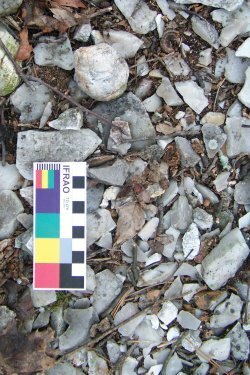 Chipping debris and a broken hammerstone litter the ground near quarried novaculite outcrops. 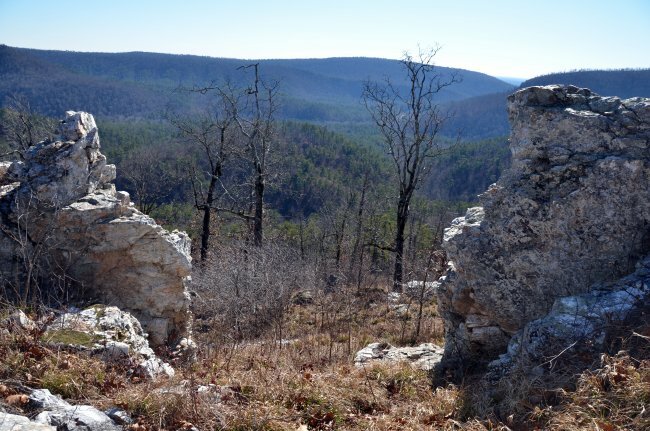 Trails have been documented on mountains in the Ouachita Mountains that may be ancient paths connecting novaculite quarries with workshop or residential sites in the valleys below. With hand-held global positioning system (GPS) recorders, archeologists can record precise locations of features at sites, adding to the database that can be used by researchers, state and federal agencies, and Indian Tribes. 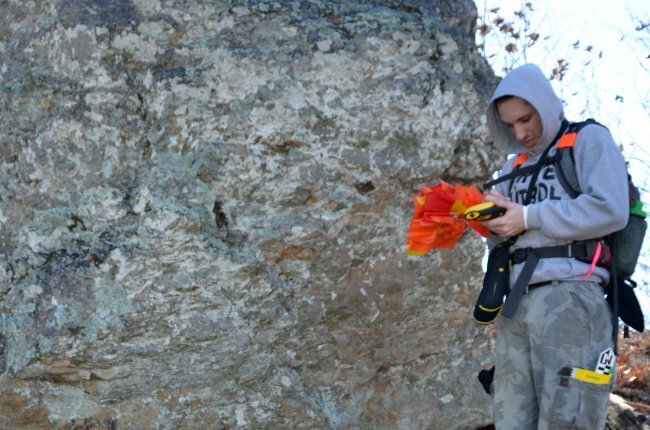 Tyler Stumpf records GPS coordinates at a novaculite quarry feature. 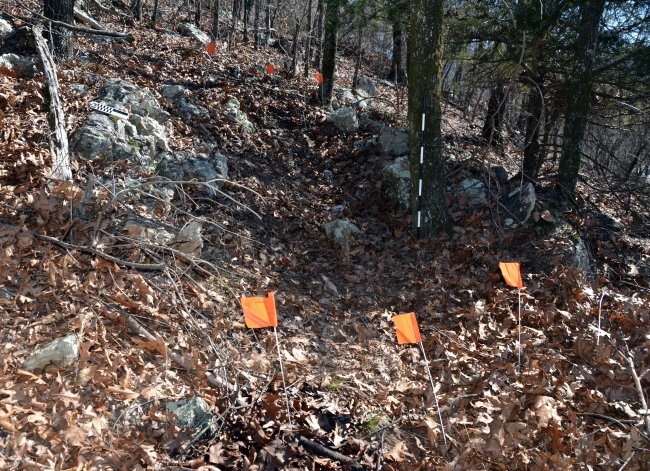 Studying novaculite use was part of the research strategy on the Arkansas Archeological Survey’s Fancy Hill project, as described by William Martin. Indians living in this area may have obtained their toolstone from quarries on mountain ridges but also found abundant novaculite cobbles in riverbed gravels. Archeologists look for remnants of the original weathered surface or “cortex” of the raw material. 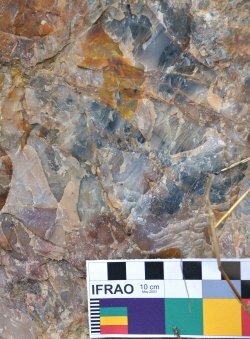 Stone tools and flakes may still have areas of cortex if knapping did not remove it. Identifying cobble cortex as opposed to a stained weathering rind typical of exposed bedrock is one way archeologists can differentiate gravel sources from outcrop sources of novaculite. Archeologists examine novaculite cobbles in stream bed at 3MN207 (Martin 1982:Fig.33). 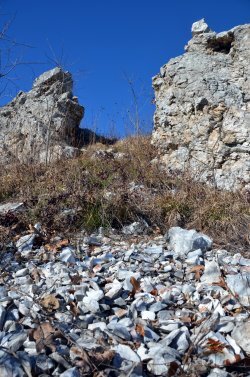 Several archeological projects in the Ouachita Mountains have studied how toolstone was acquired and used by researching different kinds of sites, such as quarries, workshops, and campsites. 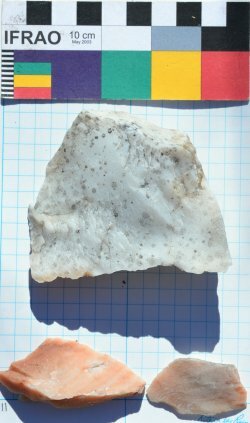 Ouachita National Forest archeologist Roger Coleman reported on a testing project at one Montgomery County site where these different activities – getting the novaculite, making and using tools, and camping for a short time – all took place. 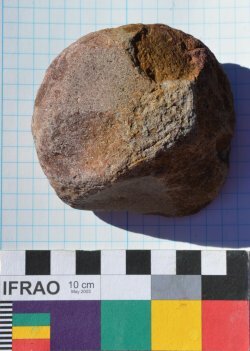 The Indians at site 3MN2075 used some novaculite from nearby outcrops, used some novaculite cobbles, and brought in some novaculite from elsewhere. They began chipping (early stage reduction to form thick bifaces), and perhaps heat treated the stone here as well. Archaic period foragers also used and re-sharpened chipped stone tools during their stay at this place. Archeologists surveying in the Ouachita National Forest have found more archeological sites in and near the Benton-Broken Bow Uplift than further from novaculite bedrock sources. Clearly, access to toolstone was an important factor in where people lived in the past. Novaculite outcrops and a view of the Ouachita Mountains. For photographs and descriptions of raw material samples from Montgomery County, select a site below or go to the Comparative Collection page. Coleman, Roger E. (2003) Novaculite Acquisition and Use at Little Missouri Falls: An Early Middle Archaic Site in Montgomery County, Arkansas. The Arkansas Archeologist 41:15-43. Early, Ann M., editor (2000) Forest Farmsteads: A Millennium of Human Occupation at Winding Stair in the Ouachita Mountains. Research Series 57, Arkansas Archeological Survey, Fayetteville. Martin, William A. (1982) An Intensive Archeological Survey of a Barite Mining District in Montgomery County, Arkansas. 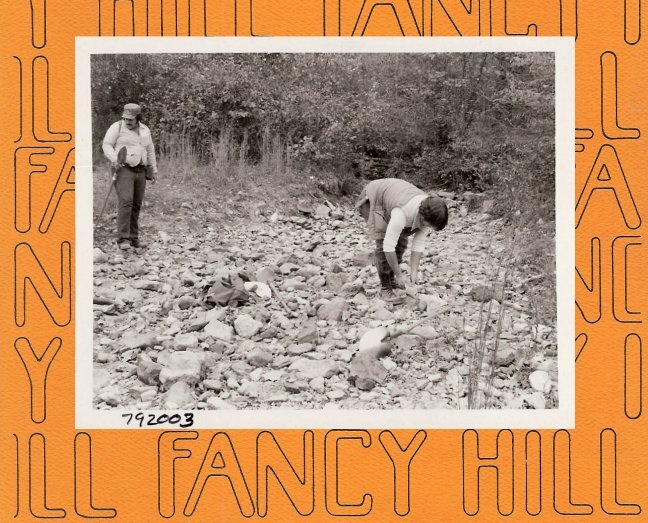 In Fancy Hill: Archeological Studies in the Southern Ouachita Mountains, edited by Ann M. Early and W. Fredrick Limp, pp. 1-182. Research Series 16, Arkansas Archeological Survey, Fayetteville. Perttula, Timothy K. and Bo Nelson (2004) Certain Caddo Sites in the Ouachita Mountains of Southwestern Arkansas. Caddoan Archeology Journal 13(3&4):21-56.